Seattle is a city of neighborhoods, albeit one in the middle of a serious growth spurt. Much of the expansion is concentrated downtown, which is taller and more futuristic than ever before. But this urban renaissance has also spread further afield, infusing already-lively enclaves with even more flavor. Read on for our favorite districts for living, shopping, dining, strolling or simply exploring. 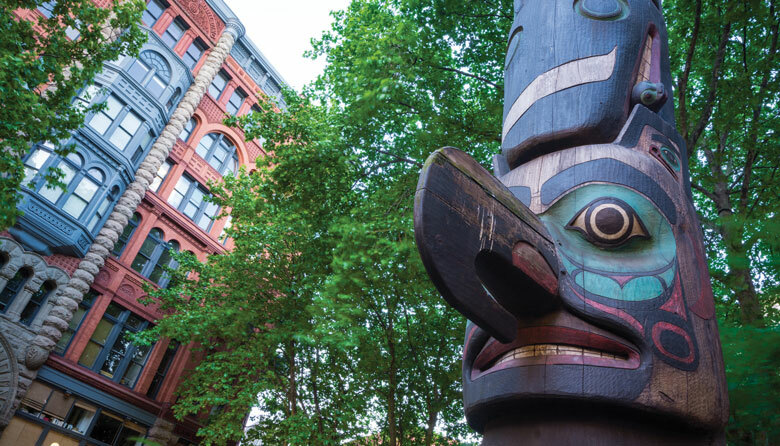 Awash in heritage architecture and local history, Pioneer Square is Seattle’s original neighborhood. Much of action has moved north to Belltown over the years, though pioneering restauranteurs and shopkeepers are trying hard to bring this history-laden ‘hood back to its glory days. Meanwhile, turn-of-the-century buildings have been converted into new apartments, art galleries and businesses, particularly around Occidental Park, basically the local equivalent of this neighborhood’s downtown. 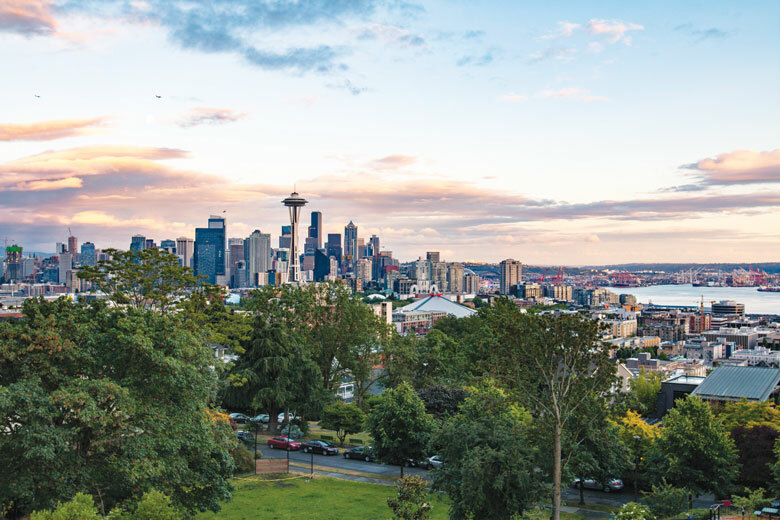 Named for a Victorian-era architectural style, Queen Anne is essentially two neighborhoods connected by a huge hill. Awash in trendy restaurants, bars and high-rise condos, Lower Queen Anne hosts The Space Needle, a 520-foot observation deck and sky-top restaurant, nearby the Seattle Center, Museum of Pop, and a vibrant theater and event scene. Upper Queen Anne offers an entirely different scene, with lavish homes, beautiful lookouts and a strikingly small-town residential vibe. Locals joke that singles live on Lower Queen Anne then scale the hill once married. Seattle’s shopping and commercial heart is a charming mélange of retail shops, soaring towers, hidden parks and stately government buildings anchored by the Pike Place Market. Opened in 1907, this iconic structure, and one of the country’s oldest continuously-operated farmer’s markets, has in turn seen new restaurants, outdoor stalls, and a viewing platform overlooking Elliott Bay. A long staircase leads down to the waterfront, which is lined with ferry docks, cruise ships, souvenir shops, and more restaurants conducive to a scenic waterfront stroll. Ongoing renovations will rebuild the seawall and incorporate new parks, bike paths, walkways to further connect this area to the new Pike Place Market expansion (that opened last summer) and the rest of downtown. Wedged on the northwest edge of downtown between the Pike Place Market, Fifth Avenue and the Space Needle, Belltown has long been one of Seattle’s most desirable neighborhoods. Recent years have seen the steady addition of luxury condos, which beckon residents with their luxury amenities and prime location within walking distance of the city’s best food, music, bars, cinemas, galleries and shopping. Much of the magic happens along First Avenue, but Fourth and Fifth Avenues reveal The Palace Kitchen and Lola’s, both specialty restaurants in the shadow of Seattle’s monorail from Seattle’s most famous chef, Tom Douglas. Working cranes have reshaped Seattle’s skyline in recent years and South Lake Union is central to the action. Not so long ago, this former logging district was eerily quiet, but that was before e-retailer Amazon moved in, reshaping this neglected neighborhood into a vertical jungle awash in gleaming office towers, luxury apartments and new bars and restaurants. Crowds thin out considerably once the tech workers head home, but this area still hosts many lakeside (and boat-up!) dining options, including Daniel’s Broiler and Duke’sand the MBar rooftop, overlooking the seaplanes coming and going on Lake Union. With its sweeping beaches, seafaring history and thriving bar, restaurants and music scene, Ballard has lots to love. This sprawling neighborhood was traditionally home to Seattle’s Scandinavian settlers, though much of that heritage has been consumed by newer apartments, townhouses and condos, in turn drawing a younger crowd. But the area’s strong schools and sense of community still appeals to families, particularly up around Blue Ridge, a residential enclave with stunning views of the Olympic Peninsula and Puget Sound. Nestled between Ballard and Greenlake, this fluid pair of northern neighborhoods is generally summed up by one catch-all moniker: PhinneyWood. Alas, rising rents have forced some businesses to close, but the current mix of high-rise apartments and houses remains more affordable than nearby Ballard. Regardless, this kid-friendly place maintains a strong sense of community with a colorful blend of cafés, yoga studios, bookstores and schools, lending an all-around appeal popular with singles and families. Just east of downtown across Interstate-5, Capitol Hill is a hub for Seattle’s LGBTQ community — and hosts some of Seattle’s best music, restaurants and bars. The base of the hill is blanketed by apartments and condos, while residential pockets boast lavish multi-million-dollar homes. Nor is this diverse neighborhood’s charms just limited to nightlife; book-lovers gather at the Elliott Bay Bookstore, a Seattle favorite since 1973, and savor clear skies at the 48.3-acre Volunteer Park, which also hosts the Seattle Asian Art Museum. Even some locals don’t know Seattle’s founding father, Arthur Denny, first landed in West Seattle before finally moving to Pioneer Square. 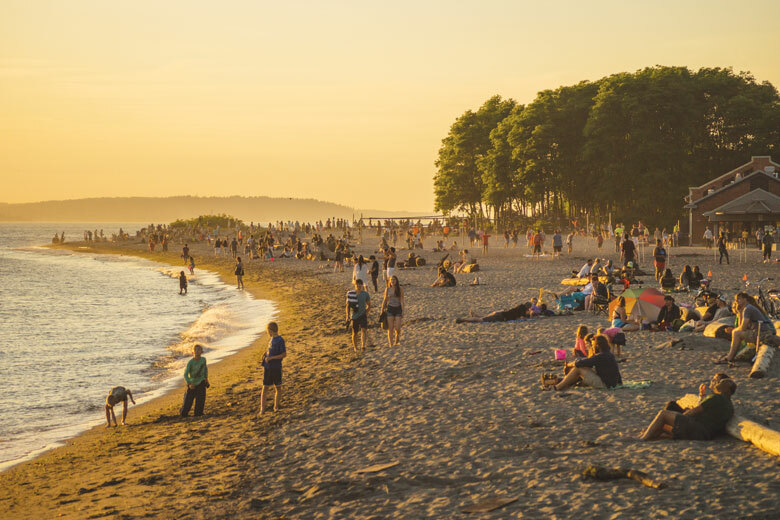 Today, Alki Beach remains the city’s premier leisure destination, flanked by million-dollar houses and condos overlooking these western shores with long wide sidewalks for biking and walking. Meanwhile, millennials gather in the Alaska and Admiral Junctions, where high-rise apartments and condos have inspired a corresponding wave of new shops, bars and restaurants, inspiring an interesting demographic shift that’s left this once family-oriented neighborhood utterly transformed. Across Lake Washington from Seattle, West Bellevue offers the best of Pacific Northwest living — though this luxury won’t come cheap. Here property prices have risen 30 percent in a single year. 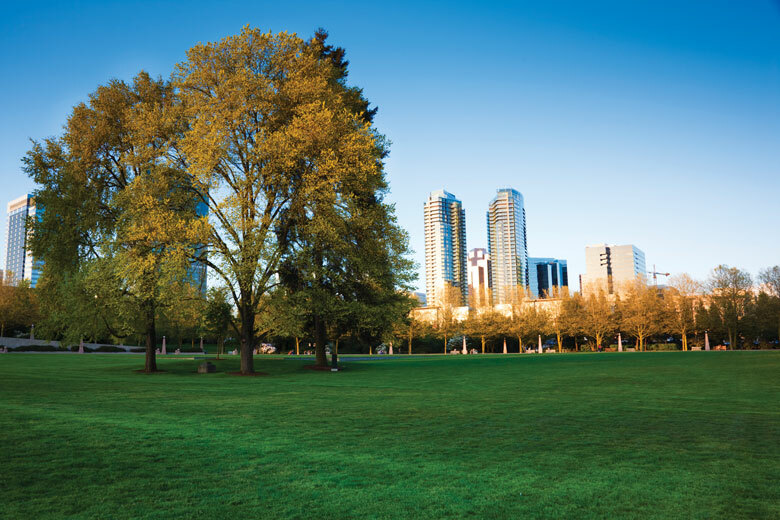 Great schools, lush parks, diverse restaurants and a peaceful suburban setting offer significant appeal for families, while easy access to bustling downtown Bellevue and Seattle is a bonus for commuters. Bellevue isn’t the only Eastside community to see a growth spurt in recent years. Just north of Bellevue, neighboring Kirkland is experiencing a similar sense of revival, buoyed by a thriving economy and bevy of new housing. Great schools, small-town vibes and a sweet “downtown” on the shores of Lake Washington ups the ante for families, while proximity to Seattle (just 12 miles away over the I-90 or I-520 bridges), downtown Bellevue, Microsoft’s Redmond Campus and Woodinville wine country appeals to commuters and leisure travelers. Further along I-90 near Lake Sammamish, this forested valley of 35,000 people is a suburban nature lover’s paradise. Hugged by a trio of mountains known as the “Issaquah Alps,” this former logging town is defined by its pristine setting, local arts and restaurants, great schools and ubiquitous housing, once known as McMansions. The influx of millennial employees working at Amazon, Microsoft, Costco or Boeing have only fostered this area’s suburban growth, though their relatively understated tastes have given way to the more streamlined “McModerns” currently in vogue. Home to local billionaires including Bill Gates and Jeff Bezos, monied Medina is basically the Beverly Hills of Seattle, without the shopping street. Even basic homes here start in the low millions of dollars, while waterfront mansions could easily set you back $10 million. (Those float planes and yachts are extra). Such prices are usually unthinkable for most people, hence the small number of residents (about 3,000) who call Bellevue’s most prestigious gated community home. Don’t Miss: Aspirational boating past Bill Gates’ 66,000-square-foot waterfront estate, Xanadu 2.0, which is valued at a cool $124 million. Perched on a 1,000-foot hill due south of Bellevue, this diverse community offers suburban flavor with sweeping views of downtown Seattle and Bellevue. As the de facto hub of Bellevue’s Chinese community, this beautiful neighborhood offers more than just shaded boulevards and beautiful houses; residents also enjoy access to Bellevue’s superior school system and quick commutes to downtown Bellevue and Seattle, about 10 or 20 minutes, respectively, by car. Near I-90 on Lake Washington’s western shores, this leafy lakefront district remains one of Seattle’s best-kept secrets. A mix of townhouses, apartments and stately single-family homes cater to diverse budgets, though the best properties are located right on the waterfront with prime views of the neighborhood’s namesake mountain. The central location is a boon for commuters working in Bellevue, while convenient light rail access makes it easier than ever to move around town. Note: Median home value is from Zillow; median household income is from areavibes.com.